I traveled close to home this past weekend to a city in Utah. It’s interesting to see how people live so differently from me, being only a 6 hour drive away. Salt Lake City is predominantly Mormon and stereo-typically known for being a modest city. Which… if you’ve ever HEARD of Las Vegas, you know it’s the polar opposite! Salt Lake’s bars close before 1am, nothing is open on Sunday’s, and has the temple as the focal point of the town. While on the other end of the spectrum, Las Vegas has never heard of last call, even Chick Fil A will be open on Sundays, and has strip clubs as the focal point of the town. My point here is, you don’t need to take weeks off work and spend thousands on plane tickets to indulge in a new culture. Try exploring your own backyard & neighboring cities! I keep a list of all my winter essentials and favorite finds on this guide here. I am constantly updated it after every cold destination – tried, true & tested! Also, I have a list of my 10 travel essentials I can’t live without, you can read those here! The drive from Las Vegas to Salt Lake is roughly 6 hours (unless you have to stop to pee 2935872958 times like me). The beginning of the drive is boring and flat desert, but once you pass the Arizona State Line, the scenery will change drastically. About an hour and a half into the drive, you will drive through a breathtaking, winding gorge, called Virgin River Gorge. The towering red cliffs paired with a winding river makes this part of the drive absolutely stunning. After you exit the gorge, you will enter into the growing town of St. George, Utah. If you aren’t in a rush, I encourage you to stop for a late breakfast at The Egg & I for the best breakfast potatoes and adorable, farmhouse decor. Once you arrive in Salt Lake City, check into your hotel before grabbing dinner. I couldn’t recommend staying in Downtown Salt Lake enough. This is where all the bars, coffee shops and restaurants will be located. I stayed at The Peery Hotel in the center of Downtown. This hotel is an older style, so the rooms are fairly small, but the entire hotel is remodeled and beautiful! They have a nice hotel restaurant / bar with a delicious wine bar right next door (yes, I always judge a hotel by the nearest wine bars, ha!). For dinner, you MUST go to The Ramen Bar right on Main St. It was the best ramen I have ever had, and is walking distance from any hotel in Downtown. After filling your belly up with some warm soup, start your bar hopping adventure along Main St. There are so many quirky bars, fancy cocktail bars, or speakeasy’s to choose from! The best part about going to Salt Lake City in the winter months, is there are a lot of travelers coming to snowboard/ski in Park City. The bars will be filled up and fairly lively. Before everything closes down at 1pm, head over to London Belle for dancing with their live DJ! Start your morning out with one of Salt Lake’s many coffee shops. Beware though, a lot of things are not open on Sunday! A coffee shop in downtown that has amazing avocado toast is La Barba Coffee. After you’re fueled up, walk up to temple square to see the Salt Lake Temple. Salt Lake City is the headquarters of the Mormon church. This is where people from all around the world dream of having their wedding and begin their missions. With that in mind, you can imagine how big and spectacular this temple is. Even though you can’t enter the inside of the temple, you can walk around the gardens along the outside. Next up, one of the best malls I’ve ever been to was in Salt Lake. The entire mall has an indoor/outdoor feel with a stream running through the center. They have the best selection of stores, not to mention all of the stores being 2x their regular size! Stop for lunch at Made From Scratch for the yummiest food ever! If you like blue cheese, get the bacon and blue cheese burger, wow. Amazing. After lunch, it’s time to head out of Salt Lake to Midway, Utah. In the winter months, this small town in Utah makes the most extravagant ice castles. They light up at night, have slides running through the castles, and Elsa and Ana from the Frozen movie greeting you at the door! In my opinion, I thought the scenery to Midway was worth the hour drive. Be aware that these sell out surprisingly fast! I tried booking tickets the week of and all the best times were taken. The best time to go to Midway Ice Castles is while the sun is setting, so you can get the best pictures while the sun is out, and still get to experience the castles lit up. While you’re in Midway, you can also take scuba diving lessons in Homestead Crater. I know what you’re thinking, swimming in Utah’s winter season!? But the crater is heated, so think of a giant hot tub that is underneath a big pile of snow! Homestead crater is in the same parking lot as the ice castles and you have the option to book scuba diving, snorkeling or just regular swimming. After your fun in Midway, it’s time to head back to Salt Lake City. You want to make sure you get your drinking in before all the bars shut down for the night! Remember that wine bar I mentioned earlier? Unwind from your busy day at Sonoma Grill & Wine Bar, which is located directly adjacent to the Peery Hotel off 300 S & West Temple. Stopping at Mystic Hot Springs makes the drive to Las Vegas longer by about 45 minutes. In my opinion, I think it is 100% worth the extra time. Not only for seeing these unique hot springs, but you also get to experience a different drive than the way there. Mystic Hot Springs are located in a tiny town in Utah. When you drive up to the property in Monroe, it will be extremely creepy and the voice in your head will be screaming at you to abort! You have the option to camp on the property either in a tent, cabin, or in their vintage buses. They have occasional concerts that play, which unfortunately I missed by just a few days! 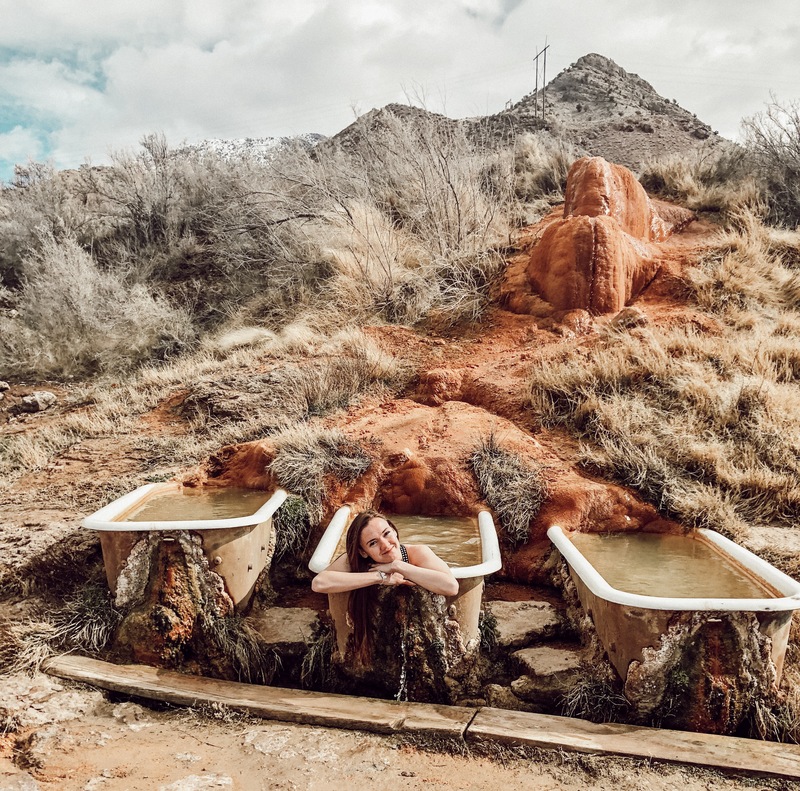 Thank you social media for allowing me to find this quirky little hot springs in the middle of the Utah desert. How else would anyone find this place!? Luckily since this hot spring is so remote, it is still pretty untouched. The crowds are minimal, so I wouldn’t worry about not getting a tub all to yourself! Or three, like this picture! You could most likely book an entry ticket when you arrive, but to be safe since you are driving an hour out-of-the-way, I would purchase one in advance here. TIP: I would bring baby wipes for after you get out. You feel a little sticky from all the sulfur in the hot springs and there is nowhere to rinse off. That’s a wrap! 3 Day weekend get-a-ways are so nice because you can see a little piece of the world without having to spend a fortune to get there! Like this guide? Pin it here! My Big Fat European Road trip! Best Travel Books for a Long Flight! 10 of the WORST people to travel with!